When the church was rebuilt in 1863, a village school was built, by grant and subscription, next to it, in the centre of the valley. Previously, children would have been taught in the chapel. The school closed on October 31st 1946 with only 7 on the register. The building is now the Community Hall. My family moved to Murthwaite in Longsleddale in 1939 when I was 3 years old. My father, George Edward Dawson, had been born in the valley, at Docker Nook, in 1892. He started school in March 1897, and can be found in the register page below. Then he left the valley to farm elsewhere, and he served in the first World War. 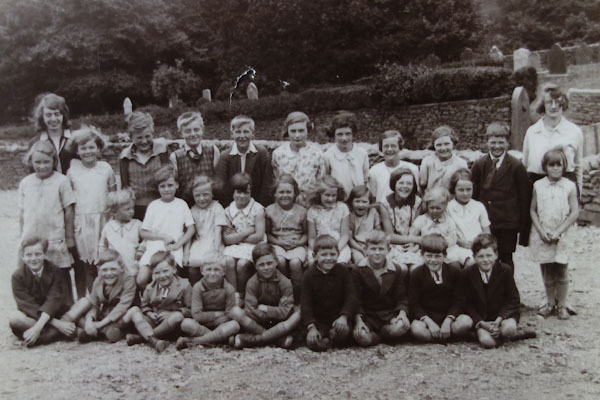 During the second World War we had evacuee families living with us at Murthwaite and nearby, and I am still in contact with them. My earliest memories are of playing with other children in the fields, and our favourite place was the island in the river. From the age of five, I walked or cycled the 2 miles to the village school. There were 2 entrances with small cloakrooms, the present front door for boys, the back one - now the kitchen - for girls. The toilets in the separate block were buckets! As many as 17 pupils were taught in the single room, by one teacher, the infants starting in the north-west corner around a big stove, moving to the other end of the room as they grew older. Mrs Worden was the excellent teacher for most of my time there. We did not have a sports area but did Music and Movement to the radio. Electricity did not arrive here until Christmas 1959 so the radio ran on batteries, which faded towards the end of the week. The farmers wives took their batteries into Kendal on Saturdays to be charged at Gilbert Parkinson's Cycle Shop at the bottom of Kent Street, whilst they sold their eggs and butter in the Market Hall. But the old glass/acid ones had to kept hidden on Sammy Mitchell's weekly bus as he did not like carrying them! 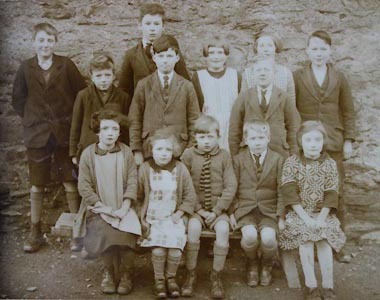 I left the school just before it closed in 1946, when I passed the scholarship examination to the Girls High School on Thorny Hills in Kendal. I was married in the valley and brought up 2 children at Murthwaite, where my son, his wife and 2 of my grandchildren now live. My husband and I live next door. Kendal Record Office also holds the School Log Books 1885-1946 (WDS70/1) which were kept by the teacher. There was usually only one certificated teacher, man or woman. In the early days someone else would teach the girls needlework, and maybe an ex-pupil would act as a teaching monitor. The parson visited regularly to give Religious Instruction. Teachers rarely stayed long, sometimes less than a year. 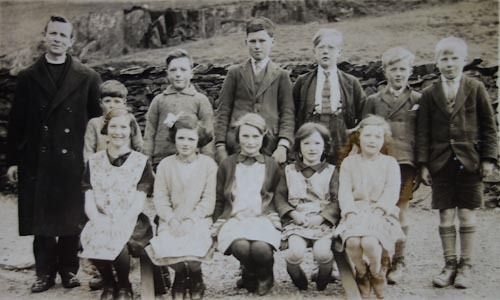 The age of pupils ranged from 5 to 14, and even in the late 1930's some children over 12 were not able to attend the Senior School in Kendal "on account of the difficulties of transporting them." 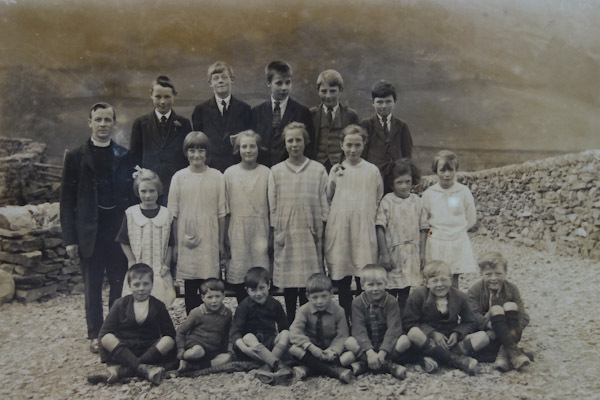 The number of children on the role was usually between 3 and 30; in the mid 1930's school numbers increased temporarily during the construction of the Haweswater aqueduct. January 30th 1885 Examined the children and found them most backward in spelling. 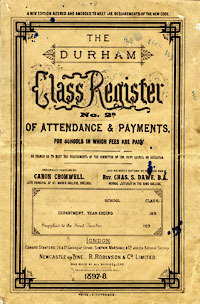 February 20th 1885 School Fees reduced to threepence per week. June 9th 1885 Talked very seriously to all the children about speaking the truth..
January 27th 1886 No school this week owing to dreadful storms and snow. November 19th 1886 The attendance during the past week has been very low, owing to the servants being away for their holidays and the children having to stay at home to work. June 20th 1887 Schoolwill be closed tomorrow the 21st being the Jubilee Day of Queen Victoria's reign. September 30th 1887 Revd. W Barnes visited school and questionned the children on the Creation, and heard them repeat the 1st Psalm. Received hodd of coals for winter fires. 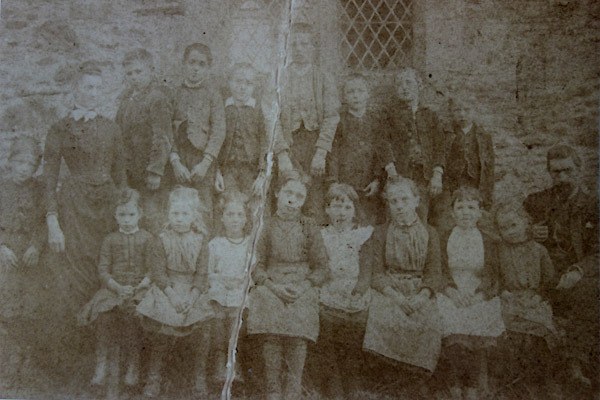 This photo is about 1890 but without a precise date it is difficult to list the pupils - about 50 children were on the register at various times between 1889 and 1891, some for very short periods. Thomas Gibson was teacher with Mrs Gibson until 21-4-1890, then Thomas Wright with Miss Wilson. June 5th 1889 [measles] ... School closed by order of the Medical Officer. June 24th 1889 ... the school shall remain closed another week. ... The Sanitory Inspector has disinfected the premises. July 1st 1889 The Hay-harvest has begun and the parents require the children at home. July 11th 1892 Eight children away all day on account of sheep clippings. September 15th 1893 The Dixons (3) have been kept away dipping lambs, raking brackens, & picking potatoes. December 1st 1893 Seven boys are absent today - foxhunting. January 1894 ... deficiencies in reading, spelling, composition, mental and written work. Singing is sweet, but too slow, and is much wanting in animation. Boys draw well, needlework needs attention, though knitting has begun. July 1st 1898 The school will be closed on Monday for the children's excursion to Morecambe. November 3rd 1898 School was not opened yesterday. The roads being in many places knee deep in water, neither children or I were able to cross. January 19th 1900 Alice Miles has been absent from school today. The bridge connecting the house with the road has collapsed ... because of the heavy rain. February 7th 1900 The schoolroom this morning is intensely cold. Thermometer is actually at 27degrees [F] and the slates are frozen. ... the children are to be kept as near the fire as possible to keep themselves warm. February 19th 1900 Resumed school [since Feb 8th] - roads still very bad. To avoid data protection and privacy issues, we have not included the identify of the pupils from the 20th century photos on this website. April-May-June 1928 ... all except 4 children have whooping cough. February 26th 1931 School Dental Surgeon gave treatment. Nurse Martindale weighed children. April 1st 1931 Dr Wright ... examined the scholars who required their eyes testing. September 2nd 1931 The piano tuner called and tuned the piano. May 6th 1935 Annual School Party. Tea and games - prizes for good work. 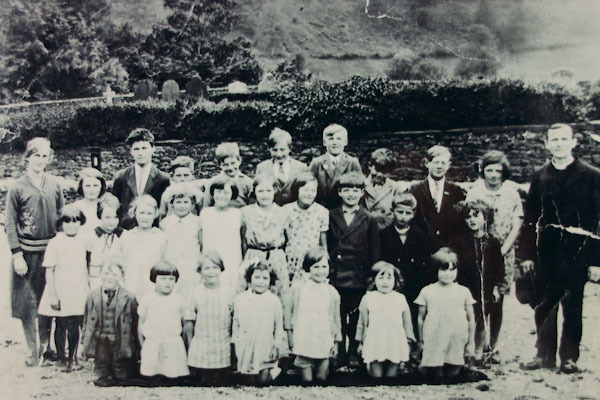 July 8th-10th 1940 All schools closed on account of evacuation of school-children from Newcastle to Westmorland. August 1940 Mr Tipper called this afternoon to examine arrangements for Air Raid Precautions. It was decided that the children should take cover in the two porches, the windows of which are to be protected by anti-splinter net and a piece of heavy fabric to be nailed over the plaster work. 28th October 1941 When I arrived at school this morning the room was full of smoke and fumes from the new stove. The flames were shooting out into the room. There was a strong wind blowing ... the man who had installed the stove ... said he thought there was no remedy. January 14th - February 16th 1942 No children were able to get to school ... snowbound roads. December 10th 1942 The manager granted us a half-day holiday so that I could take the children to the pictures to see Charlie Chaplin in "The Gold Rush". This was part of their Christmas Treat. It was their first visit to the pictures for some of the children. September 3rd 1945 ... Victory Celebrations - a bonfire on Castle Hill and a firework display. October 31st 1946 My duties at this school terminate today, as the school is being closed, and the children taken to Selside School. Olwen Harris published a book in 1969 called "The School in the Fells" about her short time as the teacher (Miss Johnson) at this school in the early 1940s.